How is it possible, my tiny 6lb 11oz baby is one whole year old. 12 whole months. 352 Days. 8760 Hours. 525600 Minutes. This month has been a roller-coaster of party arrangements, and spending quality time with my baby before he turned the big O N E. We have been swimming, the oceanarium, the beach, the park, and had visits from my sister. I have been very emotional the last 4 week. 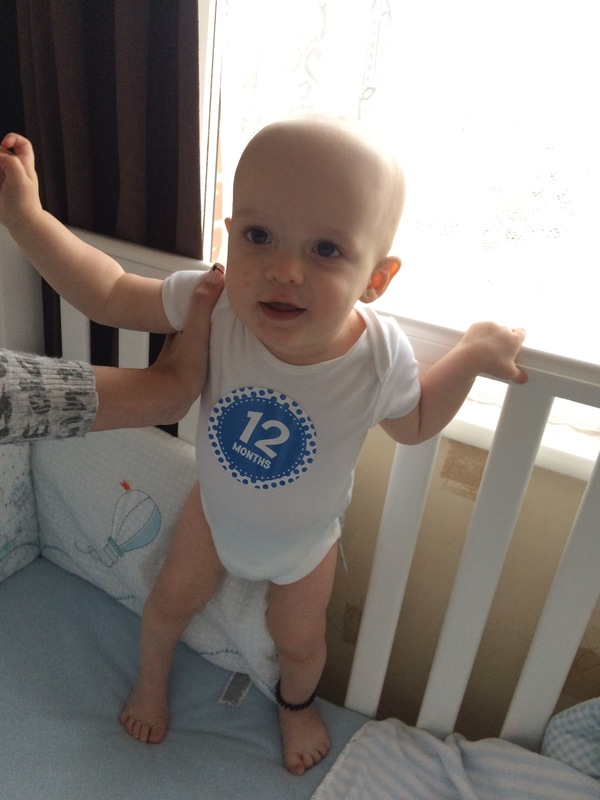 Turning one just seems like such a huge milestone, bigger than any that Archie has achieved so far. Not only have I had Archie in my life for a whole year, but I have raised a baby, a healthy happy baby, and done a pretty good job of it. This isn’t just a milestone for Archie, but it is a milestone for myself and Callum also. Archie is still sleeping 11 – 12 hour nights, goes for bed at 7 wakes up anywhere between 6 and 7. Nap wise he has dropped his nap first thing in the morning. He either has a 1 hour nap late morning or he has one mid afternoon. It is a struggle to get him to nap now, he is far too interested in everything else going on and scared he is going to miss something. Bottles are still only happening first thing in the morning around 6.30am and at bedtime around 7.30pm, both bottles having 9oz of cows milk. He will then have breakfast at around 9:30am, either toast, weetabix and banana, cereal or fruit. Then he will have lunch around 12.30 – 1.00pm, tuna past, or sandwiches with fruit yoghurt and rice cakes. Occasionally if he wants an afternoon snack he will have it around 3.00 – 4.00 and will normally be a banana or rice cake and then finally dinner at 5.00pm which can be anything from tuna pasta, fishfingers, potato and peas, chicken / beef and veg. He is very into his food and will normally try absolutely anything at least once. His favourite thing to snack on is either cheese or banana. I’m so lucky to have a child who is so good with is food. Archie is still crawling and cruising everywhere, although I think he will definitely be walking soon. He can walk with his walker and stands without holding onto anything but as soon as he realises he freaks out and falls to the floor. I think it is more of a confidence thing rather than his being unable to physically do it. I will be putting up another post with Archie’s Birthday Celebrations in as it is far too much for one post. I just want to thank everyone for being apart of our journey for a whole year. Cant wait to see how much my little monkey grows in the next year. < A Letter To Archie On His 1st Birthday. Happy birthday Archie!!! Sounds like you’ve all had a great first year. Really comforting to read about his milk as well. Thea is 7 months and she still has one night feed, then a mid morning bottle and a late afternoon. I was worrying that she needed one before bed, so was dream feeding her as she dozed off, but we worked out it was over feeding her and caused her to wake up more. Thanks Hun. It’s so hard to figure out if they are having too much or too little. I just got by Archie’s lead now as I was jut forcing it onto him and he wants feeling it. Yes she’s crawling around now, well- her version of crawling. If I get her up into her knees she can pull herself up as well. Very scary! !